I hope your food adventures have been going great in 2016. My food expeditions so far have been quite awesome. 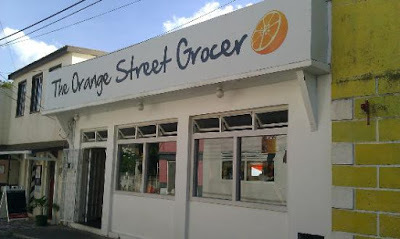 Last weekend saw me linking up with a cool Causal Dining group – “Dinner withG” at a hidden gem in Speightstown name The Orange street Grocer. The name of the restaurant was familiar but the actual location left me a little lost. However just in case you are looking for them, they are located in the last group of buildings on the sea side if you are driving through Speightstown south to north. Moving on to what you all really want to know about, the food. 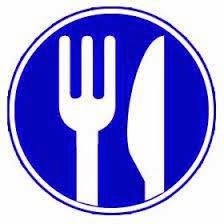 The rules of the blog are simple, food will be judged on the day and ranked by overall taste (1-5 Forks) and willingness to buy again (1-5 Knives) with 5 being the best. The restaurant will be ranked by Napkins (1-5) which rates the restaurant service, decor and any unique situations. Now onto today’s foodie adventure. Fork. Knife. Action. The decor of the restaurant instantly made me feel relaxed and really set the tone for what would be a great dinner. One thing the Chef/Owner said to the group which left an impact on me was that the restaurant tried to get most of its ingredients Farm to Table in 48hrs or less (it could be 24hrs). This meant however, that their menu could change every two days or ingredients in dishes may vary depending on availability. 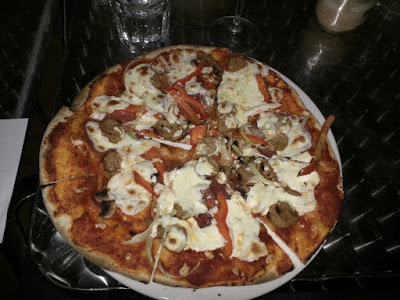 With all the options on the menu that night, I decided to have the Beverly Hill personal pizza – thin crust (Bell peppers, sausages, pepperoni and onion). This pizza was finished in 8 mins and the only reason it took so long was because I had to be social with the group. This meant I actually took breaks to talk to people and to breathe. This was truly an awesome pizza, the only thing I didn’t like was that some of the toppings were sliding off the slices when I took them up (I know some of you would like that). Not to worry, I utilized the fold technique to eat most of the pizza slices. Now what could have been better than that awesome pizza? The dessert. I am a fan coconut so I decided to tried their Coconut cream pie. If you like coconut, especially grated, then I highly, highly, once more, highly recommend this dessert. The toasted grated coconut topping was delightful and added great texture to the cream. Each bite, I swore brought a tear to my eyes. This time I got away without talking to anyone. This dessert (in the words of a friend) took me to my happy place. The dinner was overall a great experience from the food, decor, staff and great conversation in the group. The food was just heavenly and the fact you could taste the freshness in every bite enhanced it even more. The pizza and pie left a tremendous impact on me. The food is more than worth the journey to the north for lunch or dinner. I plan to be back and hopefully soon since their are quite a few things on their menu I want to sample. The decor is nice with a great view of the sea. The staff and chef/owner were friendly and quite helpful. What else can you ask for in a great restaurant. Usually the location of treasures are kept a secret but this Gem of a place is one that I have to share. If your journey for great food in Barbados takes you to the north of the island then stop in and be amazed.